False Solomons Seal is a 30-100 cm. tall perennial often found in bunches. It is the only lily to have the distinctive large clusters of tiny white flowers. 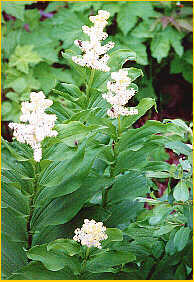 - when young, False Solomons Seal can easily be mistaken for the poisonous Indian hellebore.